In 2013 Former Chancellor Charles Bantz and Dr. Sandra Petronio established the Bantz-Petronio Translating Research into Practice Award because translational work is core to the schools of IUPUI. The award recognizes outstanding faculty research that is interdisciplinary and/or cross-disciplinary, and intentionally directed toward positively impacting people’s lives within or beyond the State of Indiana. In addition to generating knowledge through scientific inquiry or humanistic scholarship, the award recognizes faculty that actively endeavor to transform that knowledge into practices or solutions, demonstrating innovative ways to improve the lives of individuals and the communities in which they live. 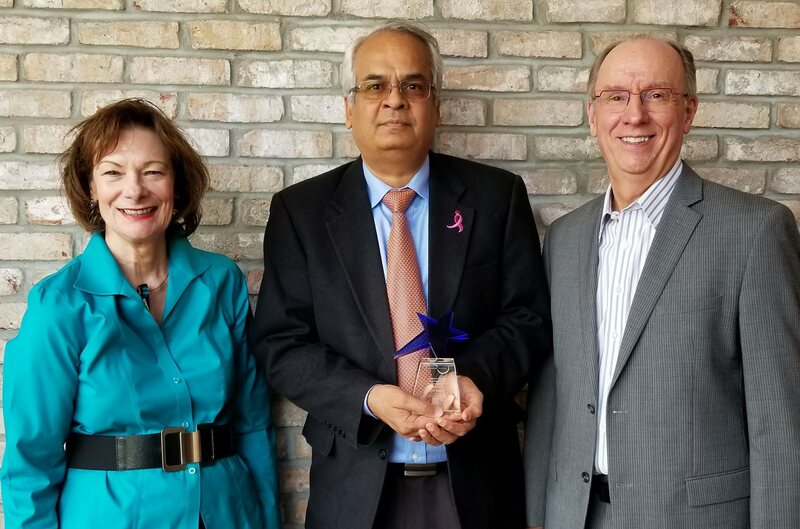 Sunil Badve, MBBS, MD (Path), FRCPath (Engl), was awarded the 20178 Bantz-Petronio Translating Research into Practice Award in recognition of his exemplary translational research in the area of breast cancer. Dr. Badve's translational research efforts on efficient treatment of breast cancer have a two-pronged approach; developing novel targeted therapies on the one hand and identifying ineffective therapies on the other. His team is studying the individual biological components that culminate in cancer. Gaining a better understanding of these molecular mechanisms will enable identification of key "nodes" in cellular pathways, which can then be targeted by biological agents leading to better diagnosis and effective treatment of breast cancer. Dr. Badve demonstrated that the FoxA1 protein plays a critical role in determining responses to anti-hormonal therapy IU patent, being licensed. His group has developed a gene signature useful for predicting brain metastasis (IU patent pending) and is currently, with (IU and non-IU) collaborators, trying to dissect the pathways associated with brain metastasis with the hope of preventing and treating this disease. He is also collaborating with IU and Purdue researchers to develop novel methods of detecting and treating breast cancer. His practical application of research into information that can be used by local clinicians in treating breast cancer is a unique and important contribution to our understanding of cancer and successful treatment approaches. Mark R. Kelley, PhD, was awarded the 2017 Bantz-Petronio Translating Research into Practice Award in recognition of his exemplary translational research in the area of cancer. Since joining the Department of Pediatrics at the IU School of Medicine in 1993, Dr, Kelley’s work has focused on translational research in DNA damage and repair, specifically, to determine how those activities can be exploited therapeutically to treat cancers and protect normal cells from DNA damage. He has focused specifically on the enzyme called APE1 as a therapeutic target in cancers and other diseases. Dr. Kelley discovered and has been developing a specific inhibitor of APE1 which he is now translating to clinical trials. This work has also led to the creation of a biotechnology company called Apexian Pharmaceuticals, of which Dr. Kelley is the Chief Scientific Founder and Officer. The first drug developed has recently been approved by the FDA for Phase 1 clinical trials in cancer patients scheduled to begin in 2017. The drug has potential uses in a number of cancers including ovarian, colon, bladder, pancreatic, leukemia, and other adult and pediatric cancers. He is also exploring the use of the target APE1 and the drug to prevent a major side-effect of cancer treatments called chemotherapy-induced peripheral neuropathy (CIPN). Dr. Kelley is committed to fast-tracking collaboration and translational research efforts in order to find more effective cancer treatments. He also mentors and encourages students, post-doctorates, fellows and junior faculty in translating their research into practice to expand the number of discoveries that help solve problems and make life better. Patricia Scott, PhD, was awarded the 2016 Bantz-Petronio Translating Research into Practice Award based on her outstanding translational research. Dr. Scott's work to enable more individuals to engage in full participation in society, not only following liver transplantation but through establish a cross-culturally valid role participation tool, is another example of how IUPUI's faculty members are translating their research into practice. Dr. Scott is Associate Professor, Occupational Therapy in the IU School of Health and Rehabilitation Sciences. Susan Hickman, PhD, was awarded the 2015 Bantz-Petronio Translating Research into Practice Award in recognition of her exemplary translational research in the area of aging and end of life care. Dr. Hickman is committed to optimizing the quality of life for older adults in life’s final chapter through improved decision-making and communication about treatment preferences. A primary focus of her research has been on use of the Physician Orders for Life-Sustaining Treatment (POLST) Program to communicate patient treatment preferences as actionable medical orders. This tool helps ensure that patient preferences are known and communicated to improve continuity of care. Findings from her research have been widely disseminated and used to support the development of programs based on the POLST model. Dr. Hickman also co-founded the Indiana Patient Preferences Coalition, a group of individuals and organizational representatives from across Indiana in law, medicine, nursing, senior care, and ethics. This coalition created Indiana POST (Physician Orders for Scope of Treatment), based on the national POLST model. Dr. Hickman now provides education and facilitation skills training about POST to health care providers around the state. She also serves as the Palliative Care Core lead on a Centers for Medicare and Medicaid Services innovations grant to reduce avoidable hospitalizations and improve the quality of care in 19 Indianapolis-area nursing facilities. Additional work includes a collaboration with colleagues at IU Health that has resulted in the launch of the Encompass Initiative, designed to improve primary palliative care throughout the academic health system. Dr. Hickman’s work to improve quality of life for older adults in life’s final chapter is another example of how IUPUI’s faculty members are translating their research into practice. Dr. Hickman is Community and Health Systems Professor in the IU School of Nursing and Co-Director, IUPUI Research in Palliative and End-of-Life Communication and Training (RESPECT) Signature Center. Jeffrey Kline, MD, was awarded the 2014 Bantz-Petronio Translating Research into Practice Award based on his outstanding translational research. Dr. Kline has transformed the way physicians think about, diagnose, and treat pulmonary embolism (PE). The direct application of his work has saved countless lives and prevented unnecessary testing in hundreds of thousands of other patients who present with high risk medical situations. For instance, if you ask an Emergency Medicine physician how they think about PE, you will hear about the PERC rule (Pulmonary Embolism Rule out Criteria). This was created by Dr. Kline and has fundamentally changed the approach to the patient who presents with chest pain or shortness of breath. It is also because the elegance and rigor of his studies, coupled with the clarity of his language, that his work is translated into clinical practice around the world. His diagnostic research interests focus on human affect analysis, pretest probability, and novel breath-based instruments to reduce overuse of medical imaging. His human treatment research includes randomized trials of fibrinolysis and inhaled nitric oxide to reduce heart damage from blood clots in the lungs. Dr. Kline’s current work focuses on using the human face as a diagnostic instrument to further help doctors make informed decisions about diagnostic testing for blood clots. His laboratory work focuses on mechanisms and treatment of acute pulmonary hypertension from pulmonary embolism, animal models of pulmonary embolism, and a nanoparticle-delivered enzyme, plasmin, to promote clot lysis without increasing risk. He helped set up an advanced hospital treatment program for patients with severe PE, and he also created and currently runs a clinic specifically to allow patients diagnosed with blood clots in the emergency department to receive treatment at home, rather than in the hospital. Dr. Kline’s work on an interdisciplinary team including faculty and students focusing on the human face as a diagnostic instrument is an excellent example of the translational research efforts of IUPUI. Dr. Kline is Professor of Emergency Medicine, Professor of Physiology, and Vice Chair of Research in the Department of Emergency Medicine, IU School of Medicine. The inaugural Bantz-Petronio Translating Research into Practice Award was presented at the IUPUI Chancellor’s Academic Honors Convocation on Friday, April 26, 2013. The award recognizes outstanding faculty research that is interdisciplinary and/or cross-disciplinary, and intentionally directed toward positively impacting people’s lives within or beyond the State of Indiana. In addition to generating knowledge through scientific inquiry or humanistic scholarship, the faculty member should actively endeavor to transform that knowledge into practices or solutions, demonstrating innovative ways to improve the lives of individuals and the communities in which they live. The 2013 inaugural recipient of the award is DAVID MARRERO, J.O. RITCHEY ENDOWED PROFESSOR OF MEDICINE, SCHOOL OF MEDICINE. Since joining our campus in 2004, Professor Marrero has excelled at translating research into improvements of diabetes identification and management. He has been an invaluable leader for the Translating Research into Action for Diabetes study for more than 10 years. This work showed that improving risk factors depends upon tailoring disease management programs to specific populations to better address health disparities. In a practical application of this work, he and his colleagues have developed a tablet-based program that explains what risks of cardiovascular disease an individual person has and then educates on reducing those risks. He also implemented an innovative and successful program at the YMCA to assist in the identification of persons at risk for diabetes followed by educational and behavioral interventions focused on diet and exercise. This project is now the subject of a CMS demonstration project. Dr. Marrero exemplifies a scholar who generates knowledge through scientific inquiry and applies that knowledge to address everyday problems in our communities. His colleagues at the national level describe him as a tireless and innovative researcher and leader in moving results into action for improved health.